The New Azumi AZ-Z3E comes with a sterling silver Altus Z cut headjoint with solid silver lip-plate and riser, the body is also sterling silver with a closed hole configuration. The Z cut headjoint is handmade by Altus, the attention to detail in the handmade process creates a more responsive and flexible tone. The Z cut features a fairly rectangular shaped embouchure hole which makes it flexible and clean sounding with fantastic articulation. The headjoint is open and free with a full tone that is suitable for all styles of playing. The rapid response is especially appreciated when crossing large gaps in the range of the instrument. This new Azumi series also benefits from pointed key arms for accuracy and longevity in the key action, often a feature only found on more expensive flutes. All Azumi flutes are based on the Altus-Bennett *scale; based on the work and recommendations of renowned British flutist William Bennett and in combination with the manufacturing skills of Altus flutemaker Shuichi Tanaka. *The scale of an instrument is the relationship of the toneholes to each other, the size of each hole, and the distance of the toneholes from the embouchure. The musician will play with better intonation while expending less effort with a well built scale. Sterling silver body with closed holes. Sterling silver headjoint, lip plate and riser. Pointed French style key arms for improved key strength. Supplied in hard case with outer cover. So far we are delighted. Beautiful flute with a lovely sound. 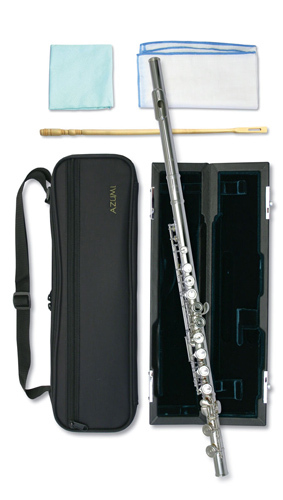 Perfect as my daughter is now reaching the higher grades and needs more than her first student flute can offer. Haven't had a proper opportunity to try the instrument out yet - but the whole feel and sound of this flute is quite obviously a step up from the ones I have played hitherto. Really looking forward to getting to know it better! I am very happy with the Azumi AZ Z3E flute which is quite an improvement on my Trevor James Cantabile 111 flute. Thankyou. I've only had my new flute for a few days, but I'm already in love! After years of playing on student level flutes, I can really feel the difference. It's much more responsive, I feel I can reach high/low notes easier and the key action feels a lot smoother than my old flute. Overall, I'm over the moon with my purchase!